Reports from the last week of struggle against austerity in Greece. On Friday the movement's self-analysis ended. The main self-criticisms mentioned were that the mobilisation on the 28-29th was not as massive as it should have been, which partly means that the government has been successful in convincing the public that the Midterm/bailout is the only way possible, that there is no realistic alternative worth fighting for. It is has also been a problem that the assembly made many decisions that it was then unable to put into practice. The issue that concerns the assembly the most now is how to keep the fight going over the summer. Summer and particularly August is a difficult period, as that is the time most people go on holiday. The numbers have already dwindled in the past week, but this is as much to do with having specific targets over this period as with the holiday season. In terms of actions, apart from those already mentioned on previous days, there has been a proposal for organising a large mobilisation on 3rd September. On Saturday, delegates from assemblies around the country and Athens neighbourhoods gathered in Syntagma for a general nationwide assembly. They were invited to describe their activities so far, the positions they have developed, and an assesment of the past month. Delegates from 34 assemblies spoke. Most assemblies were in the same tune as Athens. Their actions involved occupations, demonstrations (mostly against local politicians), protests about local privatisations and private contracts for public services, anti-fascist campaigns, film screenings, support for workers' struggles. Many have also decided - and some undertaken - to organise mutual support among those affected by the crisis, those unemployed, evicted, destitute, unable to get healthcare etc. This is associated with an initiative that began back in February, 'Nobody Is Alone In The Crisis'. I should also note that such activities had already begun in several pre-existing assemblies dating back to December 2008. The speaker from Lamia presented a particularly thoughtful self-assessment that pointed out the need to inform and attract a wider public, the need to be realistic about the movement's ambitions, and to focus on daily achievable actions, instead of aiming for the ultimate overturn of the system in a matter of weeks, in a haphazard fashion. He pointed out that the movement should have made it clearer to the public that the mid-term programme was not the main aim of this movement, but only a battle, that this is going to be a long fight. Sunday is the second day of discussions for the next steps of the movement around the country, and I will be in Athens for that. The atmosphere in Syntagma is not all that calm yet. Teargas and stun renades were thrown on Sunday to rescue a 'secret agent' who had been uncovered and was being assaulted by people in the square. Small scale confrontations between demonstrators and police have also taken place. 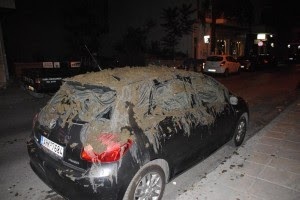 On Monday night a firebomb was thrown at a riot squad protecting the headquarters of the governing party, PASOK. Apparently Greek Police officials have had a meeting on toning down the situation, and decided to relax policing on the square. In the past couple of days there have been demonstrations against police repression, as well as outside the courts in support of those arrested. The assemblies seem a little slow in their reactions, however, to my eyes at least, considering that right now the government is aiming to arrange sell-offs and pass new austerity bills over the summer. The first is the education bill, which transforms Higher Education almost in line with the British model (3-year programmes, quality control, flexibilisation of academics, but without the fees so far), recommending the 'exploitation of the HE Institutions' assets', while abolishing the university asylum which has plays an important role in social struggles and was won through the students' rebellion against the collonels' regime. The government has also pledged to the troika that it will submit to parliament a second 'implementation law' for the midterm, which contains details about reduced public sector salaries, public sector layoffs, and reductions in social security and pensions. Up to mid-August, 7000 public sector workers risk being made redundant, as 11 public companies will be closed down or merged. In the next couple of days the full list of 350 lots of real estate for sale will be announced, with the sale to be managed by impartial and dependable organisations such as the National Bank of Greece, Alpha Bank, Eurobank, Investment Bank, Emporiki Bank and others. In response to this, I have to say I get a little impatiend with speakers at Syntagma who talk about how the assembly needs to 'clarify its principles on the kind of society it wants', to 'clarify its position on violence', to 'make a plan on how to institute direct democracy', etc. Some people even talked about organising all-night parties and tours to the islands. I am not against these things in principle but they are far from a priority! Fortunately there have also been some proposals for taking action as well, the most potentially effective of which I consider the organised non-payment of tax, bills and debts. Information campaigns have also begun that will send the message that the government's measures are not the only solution. Others are proposing networks of solidarity in neighbourhoods similar to the Argentinian model, as well as organising with students to resist the education bill. A group has been created for reappropriating public space, especially unused space, to turn it into social spaces, children's playgrounds, or use it for cultivation. The actions group is also working on organising actions and 'committees' against reposessions. An uplifting statement was that by an immigrant on Sunday, which was greeted with cheers and slogans of solidarity: "On the 48hr strike demonstrations, we also saw, beyond the teargas, how fascists were protected by police who rescued them from an angry mob and took them into the Parliament grounds. And today and yesterday these guys burnt the mosques in Evelpidon St. They are trying to divide us between Greeks and foreigners, to isolate us in our struggles, because migrants and refugees were present on 28-29, we fought together with Greeks and we will continue to be here. Syntagma square should take a clear position on this, participate in antifascist organisations, organise antifascist events as has already been done, and I support the respective discussion on Wednesday. Because a common enemy requires common action." And something that had escaped my attention. In the town of Trikala protesters intervened on a local TV channel on June 30, as the PASOK MP Soula Merentiti was being interviewed. Here's a video. Syntagma is moving towards becoming a centre for wider struggle, not simply targeting the mid term programme, but about wider resistence and self-institution. There is a wider desire to discuss actions and make connections with workers and students affected by the mid-term measures and with similar movements around europe. To organise actions that will have an impact and hit the system where it hurts. However, so far, proposals so far focus less directly on the everyday than such a desire would suggest. - Continue practically resisting the measures of the mid-term programme, to stop their implementation. - Continue campaigning for and organising a long-term general strike. Work to help increase participation. - The team that focused on the mid-term will continue to work as a group of action/overturn of the mid-term so as to address and fight against the implementation of the measures. - Organising an action group that will inform people in neighbourhoods using loudspeakers. - Discussion day on Higher Education - New measures have been proposed reducing work security for lecturers, reducing staffing levels, and threatening public free education. - Every Wednesday a round-up where all teams will give an account of what they have been doing, what obstacles they have had, whether ideas are feasible etc. - Creating a team for 'unorthodox defence' for addressing crises and for self-defence, against attacks on the square. There have been proposals to coordinate the mass of people against the police, since usually the police are grossly outnumbered. - Collective lawsuits agaist C. Papoutsis, the Minister of 'Citizen's Protection', and against the Police. Demanding the immediate arrest of C Papoutsis as the mastermind of the murderous police attacks on demonstrators. - Demanding the release of all arrestees including those falsely accused of carrying explosives (typical Greek police practice). - Demonstration outside the Courts where arrestees are being tried. - March and demos outside the houses of the Minister of 'Citizen's Protetion' and the Police Chief on Sunday. - Demand the abolition of 'pretorian mercenaries', of police special forces, of the use of chemical weapons. - Distribute a text defending the freedom flotilla to Gaza, condemning damage to boats, demanding that boats are allowed to sail, demanding freedom for the american captain who was arrested for disobeying the ban, an end to searches of flotilla passengers as if they were terrorists. - Mass demonstration to the Syrian embassy in collaboration with the Syrian community, who asked for help because they are not allowed to demonstrate, and if they do this alone they risk deportation. They were invited to set up a stall in the square and give information about the struggle in Syria. It seems that what happened on the 29th did not put an end to the violence/nonviolence debate… Those who took part in clashes and stayed in Syntagma when everyone else had left are offended because their contribution in warding off police is not recognised by everyone. They are branded as 'troublemakers' by some, while others see it merely as a matter of tactic… This partly reflects the difficulty of political coexistence in Syntagma of anarchists and other leftists, most of whom belong to left political parties. But there is also a split among those who don't belong to any of these groups. The best statement I heard out of this debate was "I don't want the specialists of declarations, neither do I want the specialists of violence". Meanwhile, a legal precedent that can enable personal debts to be written off took place today. An Athens court decided that a pensioner's debt of 200,000 would be written off, based on Katselis Law on over-indebted households. This will encourage more debtors to request debt write-offs. The square is back, fully reoccupied. Video of the return march to the square, at 3am last night. Another positive thing about today was that the square was totally free of fascists and the far right for the first time ever. Regarding the rioting, this much is clear to those who were present at the demo: That in the face of extreme and unprovoked police violence, on top of economic hardship, unemployment, homelessness and a political elite who voted to make things even worse, anyone could have picked up a stone. By 1pm today, the demo in front of parliament is as normal, no clashes, no reports of numbers yet as some neighbourhood blocs had trouble joining Syntagma because of street blockades by police... There have been some clashes in streets around town. A young woman was hit on the leg by police and was taken to hospital. Syntagma is resounding with jeers and and all the known anti-IMF, anti-parliament, anti-Memorandum slogans. 1:30pm People have broken the police cordon in front of parliament and are walking towards it. Lots of cheering and clapping. Teargas and stun grenades thrown but people not leaving. It is as if a stage for fighting has opened up in front of parliament. 1:45pm The great mass of demos has now withdrawn away from Amalias in front of parliament, some into square, some into other streets, as teargas continues to be thrown. This was not 'provoked' by anything more than some people getting closer to parliament than police wanted them to. Now they are poisoning the square again endlessly. The place is resounding with 'cops pigs murderers' 'bread education freedom the junta didn't end in '73'. ... 10 minutes later... Looks like people are returning into Amalias. Still lots of teargas. 2pm Even Paul Mason now admits this attack was unprovoked on a peaceful crowd. Of course, the crowd is now throwing stones and firebombs. What did they expect? Riot police is trying to push people further to the other side of Syntagma. 2:23 Teargassing continue. Great mass of demonstrators remain in other side of Syntagma. Live stream camera focuses on young women breaking a small wall to gather ammunition. 2:27 Police now throwing teargas further into the crowd. They are relentless. They obviously want to evacuate the entire area. Fire set to skips to break the teargas cloud, and young people are carrying objects for barricades. 2:47 Situation continues with more teargas thrown, beatings, and demonstrators throwing stones in a back nad forth movemement as the demonstrators' 'front' is trying to retake the space. Some demonstrators claim that this is not teargas but asphyxiation gas, and Maalox doesn't work with it. The police has failed in both dispersing the demo, and averting clashes with youths. The former is obstinately still there, ready to return in front of parliament, and the latter has been escalated by their provocation. The square has received 4 or 5 attacks by police but they have withstood them, many people are sick and fainting from teargas. Town hall occupations in Chania and Komotini, trade union offices occupied in Kozani. 3:20pm Police assaulting people with stun grenades trying to evacuate the space in front of Grande Bretagne Hotel. Police are also throwing stones at demonstrators. The megaphone in the square is shouting against the Memorandum and the mid-term programme. Video a group of demonstrators runs to escape police attack. One man is injured. The livestream commentator mentions an event he witnessed yesterday during the day: Demonstrators blocked the street to riot police bikers (DIAS team). They came off the bikes and with the help of riot police they tried to get them out of the way but they weren't having it. The DIAS team finally left. 3:30 Police have pushed demonstrators out of the streets surrounding the square, clashes continuing. 3:40 Group of demonstrators trapped between two riot squads in Phillelinon street, who throw teargas at them from both sides. 3:50 Demonstrators have come back into Amaliast street and things are calmer now. Still teargas but not as frequent. 3:53 A young demonstrator hit a policeman. In response 7-8 riot police beat him up and drag him around. 4pm Police reports 26 people taken into custody 3 arrested, 19 injured police. Clashes in Philellinon street. People seriously injured in the Metro. Megaphone calling on Police to step back. Disagreements between those wanting to throw stones and those wanting to stop them. Megaphone says to police if you step back we will step back. They did... They need the air to be cleared and things to calm down so that those who are injured can be treated or taken to hospital. Things calmer for a few minutes. The Mid-term programme has passed in parliament, as was expected, 155 for 138 against. 4:38 In Phlillelinon street youths start throwing stones again and police respond with rounds of teargas. Same stuff all over again. In Chania, protesters broke into and vandalised PASOK offices. 4:48 Phiellinon emptied and riot police have entered the square, throwing teargas... Someone was arrested and police threw teargas spray and pushed away photojournalists taking photos of the arrest. 4:53 Police and protesters throwing stones at each other... Teargas is thrown in front of parliament at Amalias which was now full. The Demonstrators have now all crowded inside the square and the lyra is playing. 5:19 Youths throw stones at police. Police responds by throwing teargas not at the stone throwers, but at the people in the square. 5:30 People have been trapped into the square and gassed from all sides. Someone still playing the drum while poeple in urgent need of oxygen, medical support, while police teargassing unstoppably, including the medical team. People don't have the power to defend themselves, this is relentlessly brutal. The young stonethrowers made a concerted counterattack on police forces and forced them to withdraw. When they tried to come back they had stones thrown at them and some were injured. Things being said on twitter "Don't be surprised, the next time a riot cop is torched even the trees will be celebrating"; "The only thing they are achieving by throwing so many chemicals is people's genetic modification - the sheep will become wolves!" "What we have here is STATE TERRORISM in all caps. Until yesterday I thought troublemakers were making a mistake, provoking riot police. I no longer believe this." "Arseholes! Cops ONCE AND FOR ALL! No excuses from cops' mothers any more! The are NOT doing their job! THEY ARE TORTURERS!" "SInce they are not letting people demontrate peacefully nobody can say anything now for anything that happens from now on" "You who take away my right to demonstrate peacefully and throw chemicals at me for hours, don't you talk about democracy. Bloody FASCIST!" "And for me composure has ended. The police are cops. The MPs who voted next door to chemical suffocation are subhumans" "Let's say it: throwing stones, bottles etc towards riot police is no longer 'troublesome' behaviour. It is generalised"
6:15 Teargassing of the square and stone throwing bt police and protesters continued. Now police encircling Syntagma possibly in order to arrest all the remaining demonstrators. Still teargas. Police were still too few and disorganised so they departed from the square. 6:28 Lots of people still holding the square while police seems to have withdrawn and things seem quieter for a while. 6:30 Police now hitting protesters in the square. In Romvis and nearby streets Delta team terrorising random people with stun grenades. Reported that earlier in Plaka Dias team threw rocks and chased protesters. 6:36 Riot police destroyed first aid station in the square. Urgent need for medical support. 6:50 Still 100 injured in metro station, with opened heads, breathing problems, suffering from teargas thrown inside the station. Police is not allowing ambulances into Syntagma. A PASOK MP was assaulted by crowd that threw water at him. Police is running after 400 people into Monastiraki and Psyrri. Medic reports over 150 injured seeking help. People are not leaving yet, scattering out when chased but then coming back. 7pm More teargas thrown into the square. Lots of Dias biker riot police arriving to evacuate Syntagma. Desperate call for medical support. Another injured on Ermou needs an ambulance. 7:16 Serious clashes in Monastiraki reportedly where the artists' group had escaped to 'demonstrate peacefully'. Riot police threateningly approached people who had been dancing, and threw a stun grenade and teargas. They then attempted to take people into custody. People spitting blood from teargas in Syntagma. Dias riders squad invades pedestrianised area in Mitropoleos terrorising people in cafes and restraurants - pretty shocking. Dias riders throw teargas into cafe. 7:45 People tweeting that they are going to Syntagma... Others already there that their face is burning and they feel like they will die. 7:59 Fire brigade rescued 3 people from inside Acricultural Bank that had caught fire. Riots continue, while others seemed to be walking leisurely on Amalias earlier... It's a back and forth by rioters and police. 8:24 Chemical toilet has been set to fire. Another fire inside Syntagma square. People in the square now are in the hundreds, including rioters. 9pm Riot police has entered the square again, in standoff with protesters. They encicled the square. The more tactical protesters got in front of the rioters, and walked towards the police lines with their hands up. The police lines withdrew, exiting the square. Reports that biker riot police have been swearing, and batoning old ladies, children and tourists. 10:51 Teargas continues to be thrown in Syntagma. 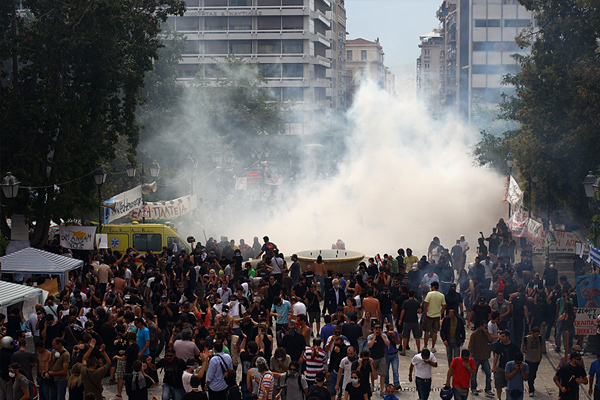 Clashes in Exarchia. 11:20 Monastiraki assembly march through city neighbourhoods and mightlife areas in Gazi calling on more people to join, in order to reoccupy the square. 01:20 400 Syntagma square people, sprayed and beaten, attempt to make an intervention on Athens 984 municipal radio station. Riot police arrived but people negotiated with radio stration to get their message through. It seems that the station has been distorting what happened. They did not allow demonstrators through, and they gave up. 02:17 The 400 heading back to Syntagma. Tomorrow there will be a demonstration at 6pm against the executive legal framework for the midterm. Meanwhile riot police is still in Syntagma where the few remaining people are risking arrest. Chios town hall was occupied. 2:30 The 400 join the remaining people at Syntagma and are greeted with cheers. Riot police did not attack this time. Video "This doesn't even happen in wartime" Doctors outraged about riot police throwing teargas inside the first aid centre despite pleas that they were doctors and that they were treating injured demonstrators. They even set fire to the roof of the medical centre, refusing to listen to any pleas. Doctors and patients were trapped inside as teargas was being thrown constantly on the first aid centre for at least an hour. Photos in the Guardian do show police violence. It was a bit of a battle in Syntagma today. To say the least... The number of demonstrators has been relatively small (up to 20,000) including the strikers, despite the fact that Metro workers finally decided not to go on strike to help everyone join the demo. The communist party march was very large in the morning. It came through Syntagma and blocked off the streets around Parliament. The marches from local neighbourhoods were arriving at around 11:30pm. Meanwhile a motorcyclists' demo began in Thessaloniki, gathering groups from all over Northern Greece, to ride down to Athens for the 29th. Demonstrators shouted angrily against foreign journalists and cameramen. Dancing with drums started in the square, while riot police numbers were increasing and putting on riot gear. At around 2pm demonstrators smashed a surveillance camera at Citibank. Soon there was tension around the square between riot police and demonstrators. Teargas was thrown while demonstrators ran after riot squads. Again clashes between anarchists and Golden Dawn fascists. At some point fascists took out knives and stabbed a man (this is what many say). The crowd cornered them into an alley and the riot police soon rescued them and responded with teargas and stun grenades. Gradually they encircled the square trying to evacuate. Street battles with police again... People threw trash at riot police, who responded with even more teargas... Parasols were set to fire as shops, McDonalds and others, on the south side of the square were being vandalised. A mobile telecommunications van was vandalised and burnt too, and some skips were set to fire (some said the fire clears up the air from chemicals?). However this time the square occupiers did not leave. Like before there was music by the Cretan lyra player and encouragement on the mike and despite the suffering from the tons of teargas they managed to defend the square, from about 4 riot police attempts to evacuate it, dancing, playing football, shouting anti-police slogans and forming human chains. The more 'militant' sections of the demo (the ones you will see in mass media almost exclusively, e.g. in this Al Jazeera video) threw molotov cocktails and pieces of paving stones pushing riot police out of the square into nearby streets. Many other demonstrators left, however, or crowded inside the Metro station, avoiding the teargas. This was a much larger amount of teargas than that thrown on the 15th. About 270 people have sought first aid help for breathing problems, and 6 were taken to hospital. By 5:30pm Athens time, the numbers seemed relatively small in Syntagma, lots of stun grenades heard but things looked pretty quiet and relatively empty for a 48hr strike. A gig to start soon with a long line-up of well-known musicians. Suddenly riot police push people out of Amalias Street in front of parliament. 5:45 Large crowd appears to be leaving towards nearby streets, although the square is still full of people. Things seem quiet but the riot police is still throwing teargas and stun grenades, attacking a small group of people out of the blue and beating up one demonstrator. 5:50 Demonstrators managed to break the police line and have flooded the street in front of parliament again, which had been evacuated. Numbers still small but growing. ?earsay account: an 'indignant' riot policeman threw away his shield, baton and helmet. As soon as his colleagues realised, they got hold of him and started beating him. 6:50 The square is now clear from teargas and it's being prepared for the concert. Things are calm, and will probably continue to be until tomorrow. Tomorrow is the 'big day' and the demo is expected to be much larger. 8pm The streets in front of Parilament are packed with demonstrators again. Some people trying to break the fences put up by police at the parliament entrance, and others throwing some bottles at riot police but were held back by the Communist Party demo guards. People started jeering against the CP demo, which again headed towards their meeting point at the Temple of Zeus. The Athens Police Department reports 17 people apprehended, 5 arrests, 21 police injured 12 of whom are in hospital. In Patras and Naxos town halls have been occupied. The Syntagma assembly has published a press release about today condemning police repression and saying 'the situation is in our hands ... we will not stop until we win"
Photos this evening by the Leftwing Mechanics. 8:30 The motorcycle demo has arrived at Syntagma. Deafening noise resounds in central Athens as hundreds of bikers honk while driving to parliament. 9pm A group of anarchists made an unanticipated attack and managed to break the fence in front of parliament, while the concert is taking place. Riot police responded with teargas and stun grenades. People in the demo that had become very large by now, running away into nearby streets, while others throw missiles at riot police. A request was made for everyone to stay at the square even though the Metro station is now closing down at 10 even though they had announced it would stay open this morning. 10:30pm Riot police threw teargas again and has again evacuated Amalias in front of parliament. People still there in the square, megaphone 'we will not leave no matter what they do'. 11pm Tergassing continues while solidarity concert continues. Many injured and a man in his 60s taken to hospital shot by a teargas grenade. 'gas chambers in city centre'. Call on everyone to come down. 11:40pm Clashes continue, with about 200 people throwing stones. Teargassing like rain continues, stun grenades, more parasols burning. Every time teargas is shot: 'cops, pigs murderers'. Punk band now playing. Police moving to surround Syntagma. 12am People are convinced this is all hapening in order to evacuate the space for the MPs soon coming out of parliament. The core of the crowd attending the concert is still in the square while some have withdrawn into a nearby street waiting for the trouble to stop. 12:15 New round of teargassing inside the square now. They need first aid support. Police not letting those who withdrew to return to the square. 1am It looks like this situation will continue until the morning. Bombardment of teargas, but people not leaving. Reports that riot police beat a nurse from the medical team. 1:30 Things seem to have become quieter now, but there are many injured. First aid team trying to help. The Metro workers finally kept the stations open until late to allow people to leave. The minister of economics has invited 'indignants' into the ministry to talk... Thought it was a joke, but no, he did say it. Timeline of events (in greek) with photos and videos. A pretty good article about today by Michelle Chen on In These Times. Some photos and more here, of people dancing in front of a rather apathetic riot police line. Another detailed timeline & photos on the Occupied London blog. And another one from ContraInfo with information from other towns as well. It's few hours before the 48-hour strike, two days of conflict and repression that everyone has been preparing for... The parliament is due to ratify or reject the mid-term programme on Wednesday evening. One factory was already picketed and blockaded by Monday night, the livestock co-op in Arta, where management had been putting a lot of pressure on workers not to go on strike. Meanwhile, EU leaders have prepared a plan B in case the mid-term is not passed, so the threats of immediate default and catastrophe by Greek politicians are shown to be just that. Demonstrators from several towns and cities of Greece are already on the way to Athens. In Syntagma, a large anarchist group attempted to challenge the nationalists who are said to almost excusively populate the area in front of parliament, by distributing a text regarding clashes with police and the presence of fascists in the square. They started shouting anti-nationalist slogans such as 'national unity is a trap, proletarians have no country' among the crowd expecting some sort of confrontation. To their suprise, most people also chanted with them, clapping and asking to read their texts, while those who complained were a minority. I suppose that is an indication that the far-right is a minority in Syntagma, at least by now, at least on a Monday? The assembly had a variety of speakers, some of whom wanted to form a party, elect new leaders, do a Spanish-style sitting demonstration and denounce all forms of violence. Others spoke against them, pointing out that this movement doesn't need leaders, again emphasising the importance of continuing to fight whether the mid-term programme is passed or not, the idea of class struggle and conflict, the importance of self defence and the interpretation of the word violence ('our occupation is already "violent" according the logic and order of things our rulers uphold'). The proposals to find new 'worthy' representatives are the ones that consitently fall on deaf ears. On the other hand the assembly moved even closer to the attitudes of the anarchist / far left contingent on the question of 'violence'. - To devote coming assemblies to discussing what to do after the midterm vote - what we do the next day. - Tomorrow should not be a battle but a celebration, with music around Syntagma. - To be tolerant towards the violence of those who clash with riot police. The megaphones should not speak against them. - To make a stamp which will be used to stamp Euro notes to spread our message. It is an idea initiated by fellow protesters in Berlin. - To set a new date for discussion of the proposed political texts that will represent the popular assembly. - To elect representatives among our movement and to work towards forming a 'government of personalities'. - To stop having assemblies at Syntagma and move the assemblies to the neighbourhoods. - To have Sunday local assembles instead of daily ones and to communicate their decisions via the internet. - To condemn all forms of violence. - All of us should wear white clothes so that we can see who wears black and wants to provoke us with violence. - To organise using mobile phones around Greece, so as to synchronise and shout the same slogan at the same time. I have to apologise for yesterday's account, in which I prejudged the political affiliations of those who complained at the assembly about ANTARSYA's intervention on the vote [text now changed and comments removed]. I should have been more careful. It now turns out that some of those who complained were from the Antiauthoritarian Movement, as they stated on Indymedia Athens. I won't get any more into this, but what does need to be said is that the method followed in the thematic assembly on politics of choosing between long texts writen by small groups, as opposed to composing one based on ideas agreed on by the assembly is just another attempt at imposing a ready-made representation on the movement of Syntagma, regardless of whether the allegation is true or not. Today the thematic assembly for politcs was meant to present three texts for discussion in order for the movement to make a political declaration before Tuesday. Sounded interesting, crucial even, but this was not meant to be. A group of 16 people denounced the thematic assembly saying that the voiting process was 'rigged' by the revolutionary left party ANTARSYA who had 'brought 50 of their people to get their text voted in'. As would be expected, that caused a huge mess with lots of shouting and indecision. The tension stalled the discussion and it was decided it would be done another day. The assembly denounced the decision of the public transport drivers union to go on strike on the 28th and the 29th, which comes counter to the decision of all the other public transport unions not to go on strike in order to provide transport for strikers and demonstrators. The unions had been under pressure by the state and police to close down the stations that day for 'security reasons'. In the north part of Syntagma, right-wing nationaiists have set up a stall recruiting their own 'guards' for the demo on Tuesday. It is likely that far-right 'guards' will again provoke anarchists, and there will be clashes. Depressing… Well that was just the negative side of it all because there were a few pretty good speakers who were outraged by the Deputy PM Theodoros Pangalos' 'dillema' posed today that if the medium-term programme is not passed "the military will have to take tanks out into the streets, to protect the banks and prevent people from withdrawing money"… Especially the younger speakers sounded like they were really up for a fight. There were also several pleas for concrete plans on the day after the vote. They also unanimously supported a new call to the 2-day demo on the 28th & 29th, which also specified the way in which a few hundred cars would cause a severe traffic jam in order to prevent MPs from reaching the parliament. It was an intense day today in the squares, which have been occupied for exactly one month now. In Thessaloniki, a Golden Dawn (fascist extra-parliamentary party) protest march was planned to pass near the White Tower square, protesting against the construction of a statue of Alexander the Great in Skopje, Macedonia. There was a decision to defend the square with the support of the anti-fascist organisation 'United Against Racism and the Fascist Threat in Thessaloniki'. They blockaded the main street to stop the fascist march going through. Soon riot police arrived, and on the pretext of preventing the groups clashing, charged against demonstrators at the camp, throwing enough teargas and stun grenades to make everyone run away frantically (video). Later, the Golden Dawn marched through Ladadika, Thessaloniki's nightlife area, shouting anti-immigrant slogans, escorted by a riot squad. Apparently things calmed down later, and people returned for the scheduled assembly. In Syntagma, it was the day against racism and xenophobia. In daytime, migrants' groups set up stalls in the square to spread info, and organised games for children. Teams of Pakistani immigrants played cricket in front of parliament, and Pakistani women made henna tattoos for demonstrators. The Black Thieves band and Back Desk group played a gig entitled 'A Song for Ahmad'. I guess such events may smack of superficial 'cultural' acceptance of immigrants, but giving them space for a cricket game directly in front of parliament, an ares which until yesterday was full of Greek flags and nationalist slogans, I think was a pretty good move. After these events there were talks from the African Women's Association, Action Congo, the Pakistani Community of Greece, and Lahsan Karza, one of the 300 hunger strikers. The main assembly itself today again voted in favour of blocking the streets around parliament with vehicles on the 48-hour striike. They also supported a statement in favour of the conflictual nature of their movement, in favour of self-defence, but against 'self-described warriors', those who fetishise the fight against police lines as an end in itself. Not clear what such a decision would mean in practice. They also condemned the anti-terrorist law that criminalises wearing a hood, and created a group that will organise legal support for those who were arrested on the 15th. Other proposals passed were to organise a feminist event with speakers from Greek and African women's organisations, an LGBT event, and to set up a group that would organise a network of direct exchange between agricultural producers and city residents. They sent messages of solidarity to those in the Gaza flotilla and to Syrian political protesters and prisoners (many Syrian political refugees are in Syntagma frequently). Greece: "We are drowning, let's sink the rotten boat"
Perhap because I forgot to put Greece or Greek in the title, people might have not noticed that this was a critical reflection on Syntagma Square and the situation in Greece, written by the TPTG . Striking Greek taxi drivers are blocking road access to the country's main airport and harbor in their latest protest against government reforms. Officials at Athens International Airport advised travelers to use airport shuttle trains after hundreds of taxi drivers blocked most lanes on the main access highway. Traffic jams also built up at the capital's port of Piraeus, where taxi drivers blocked a road leading to the cruise ship terminal. Greece is enacting major economic reforms alongside an austerity program as it grapples with a major debt crisis that nearly saw it go bankrupt earlier this month. Taxi drivers started a two-day strike to protest the government's decision to liberalize dozens of tightly regulated professions. 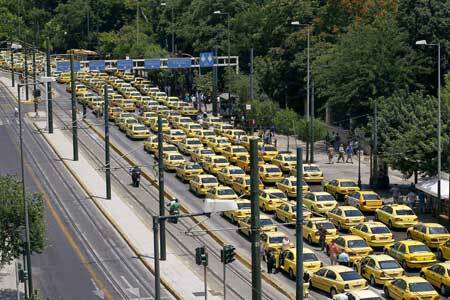 ATHENS: Greek taxi drivers blocked roads and blared their horns on Monday to protest at government plans to liberalise access to taxi licences, drawing criticism from officials worried about harm to the country’s vital tourist trade. The drivers lifted the blockade after about six hours but planned to continue the strike on Tuesday. They blocked roads to Athens’ airport and main harbour, holding up thousands of tourists arriving on cruise ships. The protests slowed traffic in the heart of the capital, with a noisy convoy of hundreds of taxis honking horns to oppose plans to free up licences as part of government plans to deregulate the economy required by an EU/IMF bailout. On the island of Crete, drivers set a cab on fire in front of the prefect’s office and shouted “Thieves! Thieves!” Authorities said the protests could hurt tourism, a key pillar of the country’s recession-hit economy. Greece, which counts on its sun-drenched islands and ancient monuments for about 16 percent of its GDP, is hoping for a 10 percent boost in revenues this year after tourism plunged by a fifth over the past two years due to violent anti-austerity protests, repeated strikes and the global downturn. Gurgaon Workers' News assess the recent massive strike at Maruti Suzuki auto in India.